700 Arrested After Protest On Brooklyn Bridge More than 700 protesters demonstrating against corporate greed, global warming and social inequality, among other grievances, were arrested Saturday after they swarmed the Brooklyn Bridge and shut down a lane of traffic for several hours in a tense confrontation with police. Police officers enter the crowd to make arrests as a large group of protesters march across the Brooklyn Bridge roadway, Saturday in New York. The group Occupy Wall Street has been camped out in a plaza in Manhattan's Financial District for nearly two weeks staging various marches, and had orchestrated an impromptu trek to Brooklyn on Saturday afternoon. They walked in thick rows on the sidewalk up to the bridge, where some demonstrators spilled onto the roadway after being told to stay on the pedestrian pathway, police said. Legal observers with the National Lawyers Guild watched the events and plan to offer legal assistance. Bina Ahmad, wearing a bright green cap to signify her role as a Guild observer, said she saw police using unnecessary violence. "There was one person who was being pulled and thrown to the ground by the police," she told WNYC's Stephen Nessen. "There was another man whose shirt had gotten pulled up, and he was dragged on his bare skin on the bridge. I don't know if I saw blood, but it definitely looked vicious." The NYPD denies there was any violence. The majority of those arrested were given citations for disorderly conduct and were released, police said. The NYPD called in out-of-service MTA buses to take them away. Some protesters sat on the roadway, chanting "Let us go," while others chanted and yelled at police from the pedestrian walkaway above. Police used orange netting to stop the group from going farther down the bridge, which is under construction. Some of the protesters said they were lured onto the roadway by police, or they didn't hear the calls from authorities to head to the pedestrian walkway. Police said no one was tricked into being arrested, and those in the back of the group who couldn't hear were allowed to leave. "We were supposed to go up the pedestrian roadway," said Robert Cammiso, a 48-year-old student from Brooklyn told the Daily News. "There was a huge funnel, a bottleneck, and we couldn't fit. People jumped from the walkway onto the roadway. We thought the roadway was open to us." Protesters trekked through the pouring rain to One Police Plaza, but soon dispersed to head back to Zucotti Park to regroup. Elsewhere in the U.S. on Saturday, protesters assembled in Albuquerque, N.M., Boston and Los Angeles to express their solidarity with the movement in New York, though their demands remain unclear. 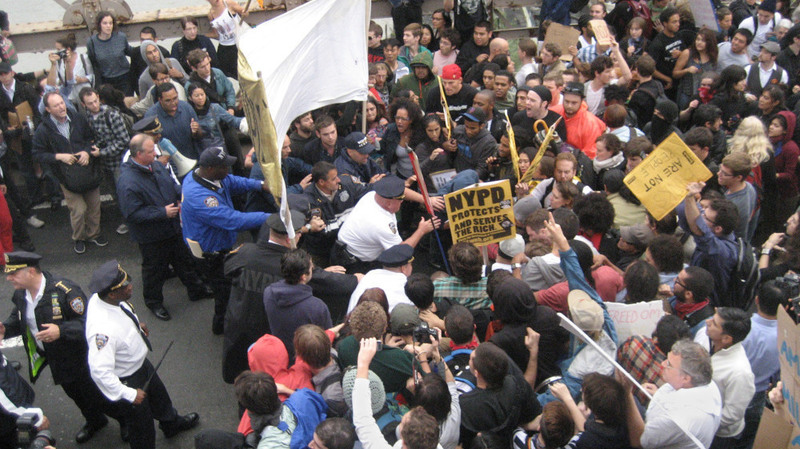 Occupy Wall Street demonstrators have been camped in Zuccotti Park and have clashed with police on earlier occasions. Mostly, the protests have been peaceful, and the movement has shown no signs of losing steam. Celebrities including Michael Moore and Susan Sarandon made recent stops to encourage the group. During the length of the protest, turnout has varied, but the numbers have reached as high as about a few thousand. A core group of about two hundred people remain camped throughout the week. They sleep on air mattresses, use Mac laptops and play drums. They go to the bathroom at the local McDonald's. A few times a day, they march down to Wall Street, yelling, "This is what democracy looks like!" One video surfaced of a group of girls shot with pepper spray by NYPD Deputy Inspector Anthony Bologna. The woman claimed they were abused and demanded the officer resign, and the video has been the subject of several news articles and commentary. Police Commissioner Raymond Kelly said internal affairs would look into whether Bologna acted improperly and has also said the video doesn't show "tumultuous" behavior by the protesters. A real estate firm that owns Zuccotti Park, the private plaza off Broadway occupied by the protesters, has expressed concerns about conditions there, saying in a statement that it hopes to work with the city to restore the park "to its intended purpose." But it's not clear whether legal action will be taken, and police say there are no plans to try to remove anyone. "You may not get much, or any of these things on the first go-around," said the Rev. Herbert Daughtry, a longtime civil rights activist who has participated in protests for decades. "But it's the long haul that matters."